Fax is still still a widely accepted means of communication for any companies around the world, certainly not the only way to communicate, but a reliable one nonetheless. Here are some reasons fax is, and will be for many years to come a trusted medium of communication. Sending and receiving faxes is still recognised as an essential way of communicating for many businesses around the world. Sending a fax is one of the simplest ways to send documents, and since many companies have been sending fax messages from he beginning of their existence, it is easily integrated into how companies communicate. It is widely accepted around the world that legal documents such as contracts and others are faxed so that they can be signed by the relevant parties. Faxing them either by traditional fax or fax to email saves you the time and effort it would have taken to coordinate schedules just for you to sign documents. When you send a fax, you receive a message confirming that the recipient has indeed received the fax. This cuts the ambiguity that comes with communicating through other means like email and sms, where you only know that you have sent the message, but are not sure if the recipient has indeed received your message. 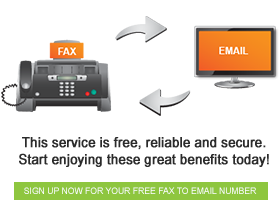 Contact us today to register to your own fax number today.